Like credit cards or car loans, some mortgages allow borrowers to have co-signers on the loan with them, enhancing their application. However, a co-signer on a mortgage loan doesn’t have the same impact that it might on another loan. Furthermore, it poses serious drawbacks for the co-signer. A mortgage co-signer is a person that isn’t an owner or occupant of the house. However, the co-signer is on the hook for the loan. Typically, a co-signer is a family member or close friend that wants to help the main borrower qualify for a mortgage. To that end, he signs the loan documents along with the main borrower, taking full responsibility for them. When a co-signer applies for a mortgage, the lender considers the co-signer’s income and savings along with the borrower’s. For instance, if a borrower only has $3,000 per month in income but wants to have a mortgage that, when added up with his other payments, works out to a total debt load of $1,800 per month, a lender might not be willing to make the loan. If the borrower adds a co-signer with $3,000 per month in income and no debt, the lender looks at the $1,800 in payments against the combined income of $6,000, and may be much more likely to approve it. Co-signers can add income, but they can’t mitigate credit problems. Typically, the lender will look at the least qualified borrower’s credit score when deciding whether or not to make the loan. This means that a co-signer might not be able to help a borrower who has adequate income but doesn’t have adequate credit. 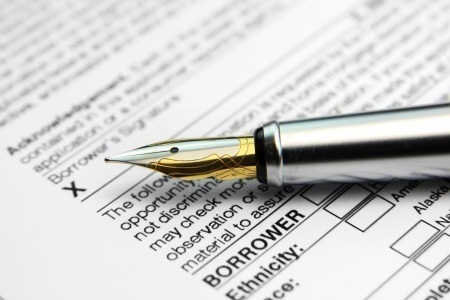 Co-signing arrangements carry risks for both the borrower and the co-signer. The co-signer gets all of the downsides of debt without the benefits. He doesn’t get to use or own the house, but he’s responsible for it if the mortgage goes unpaid. The co-signer’s credit could be ruined and he could be sued (in some states) if the borrower doesn’t pay and he doesn’t step in. For the borrower, having a co-signer adds an additional level of pressure to make payments since defaulting on the loan will hurt him and his co-signer. As always, it’s a good idea to speak with your trusted real estate professional for advice in your specific situation.